Wales' record try-scorer Shane Williams has backed wing George North to overcome his try-scoring struggles. North has crossed just three times for Northampton Saints this season and said the English Premiership club's style of play "isn't really helping my game". The 23-year-old has not scored for Wales since September's World Cup warm-up win over Italy, a run of five Tests, but Williams says the tries will come. "It happens to every player. He has got to work hard for it," Williams said. "He has not become a poor player. I have been there myself and we probably have not seen the best of George yet anyway. "Sometimes you do get frustrated but it is a sign of a player, how he overcomes that and continues to chip at it. "It is all about your composure and just working hard, possibly not trying too hard." North has crossed 23 times for Wales since his international debut against South Africa in 2010, a game in which he scored two tries. 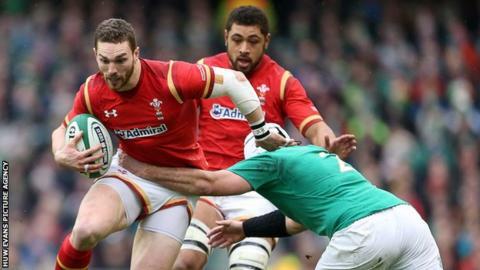 Former Scarlets wing North started in Wales' opening game of the Six Nations, Sunday's 16-16 draw in Ireland. Wales host Scotland at Cardiff's Principality Stadium on Saturday but have delayed their team announcement until Thursday. Ospreys fly-half Dan Biggar, 26, is a doubt with an ankle injury but Wales have not ruled him out of Saturday's game. Williams says Bath's Rhys Priestland, who replaced Biggar in Dublin, is more than capable of filling in at fly-half if needed. "I thought he did well at the weekend and he kicked very well," Williams told BBC Wales Sport. "There were a few mistakes like handling errors and he perhaps snatched at the drop-goal when he had the opportunity but he stood up to the plate when the penalties were on offer. "Rhys Priestland needs just a bit of confidence at international level."